A Robbinsdale family is the new owner of a popular Minneapolis restaurant. Emily’s Cafe has been a staple in north Minneapolis for more than 50 years. “We’ve been coming here off, and on I think ever since, whenever Emily’s opened up,” said customer Gary Anderson. Delicious breakfast, comfort foods, and the family-friendly environment keep folks coming back. The restaurant is named after Emily Benincasa. She is retiring and turning over the reigns to her niece, Anna Donato-Ghani. If the Donato name sounds familiar, it should. Anna has several businesses in the northwest metro, including Donato’s floral shop in Crystal and Pickles Catering and Mama Donato’s Woodfired Pizza. 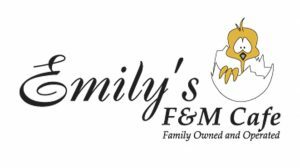 While the name is changing to Emily’s Eatery. the menu won’t change much. Donato-Ghani is increasing the lunch menu and adding healthier items. “Some power bowls, some Greek salads, some good protein, salmon, grilled turkey,” explained Donato-Ghani. She is also honoring her family’s legacy, with limited edition mugs and other items. The new owners say the warm atmosphere and welcoming environment will still be the foundation of Emily’s Eatery.